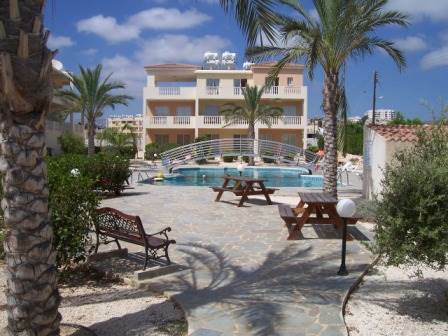 Cyprus Property Blog by Cleo : Ground Floor Apartment in Universal Area of Kato Paphos For Sale - Price Reduced! • 1 bath, 1 bdrm 3 story - €79,000 EUR - REDUCED - MUST SELL! Diana 44 is a new complex located in an ideal location in Kato Paphos, minutes from picturesque fishing port and harbour of Paphos. The apartment is fully air-conditioned and located on first floor. The open plan lounge is spacious with all furnishing and kitchen appliances included. The tastefully decorated apartment has a large balcony overlooking landscaped gardens and large swimming pool. The surrounding pool area has plenty of sunbathing areas, picnic benches, seating areas and play facilities for young children. It is situated close to many bars, restaurants, tavernas, shops and the tourist area of Paphos harbour. Allocated parking is provided, although the local bus service runs every 15 minutes to the old town of Paphos with its numerous designer, souvenier shops and large undercover market and to Coral Bay with its sandy beaches and tourist areas.